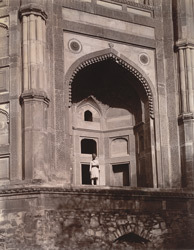 Photograph of the Buland Darwaza of the Jami Masjid in Fatehpur Sikri, taken by Edmund William Smith in 1893, from the Archaeological Survey of India Collections. The Buland Darwaza is set into the south wall of the Jami Masjid at Fatehpur Sikri. This city was built by Akbar (r.1556-1605), the third Mughal ruler of India, between 1571 and 1585. This huge gate, approached by a flight of steps, has two inscriptions in the archway and is crowned with a series of domed kiosks, or chhatris. It was probably built to commemorate Akbar's conquest of Gujarat in 1573. The central portico of the huge gate contains three entrances, the largest one, in the centre, is the Horseshoe Gate, so-called because of the custom of nailing horseshoes to its large wooden doors for divine intercession. This photograph is taken from the Jhalra, a rainwater reservoir, also known as the diving well due to the tradition of people diving from the parapet of the Jami Masjid.